Even if you’re not a 19th century teenager who likes to blame all their love troubles on a river, Germany is pretty romantic. Castles, fairy tales, clear mountain lakes, adorable villages that look like they came straight from the chocolate box – it’s all here. Best of all, most of these things are completely free to look at, wander through and take copious photographs in. After all, it’s not really romantic until all your friends are jealous. Here are 8 romantic places you can take your love while on holiday in Germany. 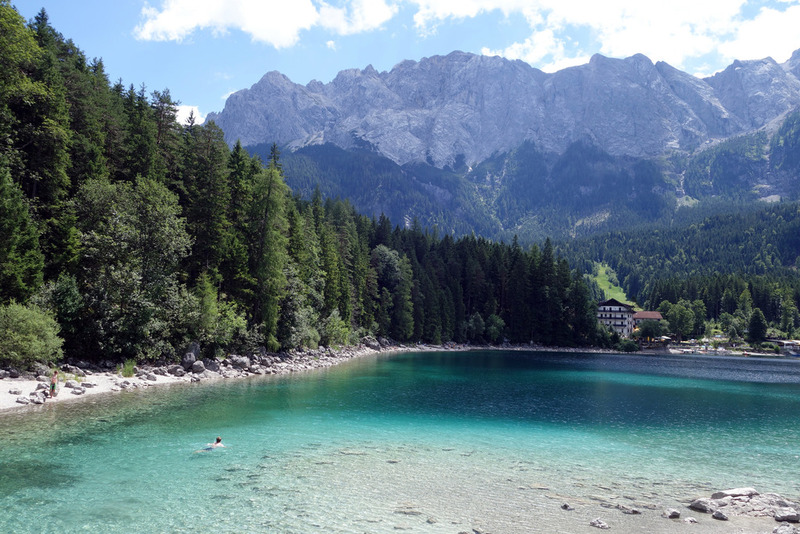 There are loads of lakes scattered throughout the Alps in Southern Germany, but one of the most spectacular – a place just made for skinny dipping – is Obersee Lake in Berchtesgaden National Park, close to the Austrian border. Camp nearby or snag a real bed in a cheap pension. Germany has excellent roadtrip-worthy places to drive. Before it unified, Germany’s many royals were in need of palaces, hunting lodges and country retreats, which means the countryside is dotted with a ton of stupendously romantic castles and palaces. For the full experience, drive the Burgenstraße (castle road) from Mannheim to the Czech border. In the Cute Old Town department, not much in Germany beats Quedlinburg. Equidistant between Hanover and Leipzig, the half-timbered houses have sagged with time – 1200 year – but have not lost an ounce of their charm. Residents have not been shy with the paint can or the flower pot and the result is a place made for camera-ready, romantic weekends away. The Eiffel region in the northwestern state of Nordrhein Westphalia is a bit like Tennessee or Kentucky in the US– rural and extremely beautiful. Monschau is a small resort town 30 kilometres (18.6 miles) south of Aachen right on the Belgian border that looks as if it has been frozen in time. Visit the coffee roaster, the mustard mill and the one of the many fantastic bakery-cafés. If it’s between Advent and Christmas Eve, running into a Christmas market in Germany is a given. Even the small ones are full of mulled wine, roasted chestnuts, twinkling lights and packs of friends getting increasingly jolly thanks to steaming hot mugs of glühwein. In Cologne with your loved one? Join the thousands of others who have left a symbol of their love – a padlock – on the Hohenzollern Bridge. It’s corny, but adorable. The bridge, 10 minutes’ walk from the main station, is one of the busiest rail bridges in the world and has so far been strong enough to take the weight of the world’s love (estimated at 2 tonnes). Be sure to throw the key in the river after adding to this charming tradition. Danube Cycle Trail covers 1,800 kilometres (1,120 mi) from the river in Germany to the Black Sea, 10 countries later. The path is well-maintained and wide through Germany, Austria, Slovakia and Hungary, so recumbent and tandem bikes work well. It’s less maintained further east in Croatia, Serbia, Romania and Bulgaria but remains passable. The last extra-romantic spot the list is in a village outside of Görlitz, so far into eastern Germany, it is just a short swim to Poland, but hiking way over here is totally worth it to see the truly magical Rakotzbrücke (Rakotz Bridge). Go on a calm day for the best atmosphere, but if the weather isn’t quite cooperating, exploring the largest rhododendron park in the country in which the bridge is located is a resplendent Plan B.